Restore 3 Health. If the target is still damaged, summon a Lightwarden. "Light it up!" - Command given to both Lightwardens and Goblins holding Flamecannons. If you use this to kill a minion with Auchenai, is the Lightwarden still summoned? Definitely better than Flash Heal, in terms of its tempo. Good in a aggro/tempo deck with Lightwarden, Holy Champion and Spawn of Shadows. My second favorite priest card after Vol'jin. 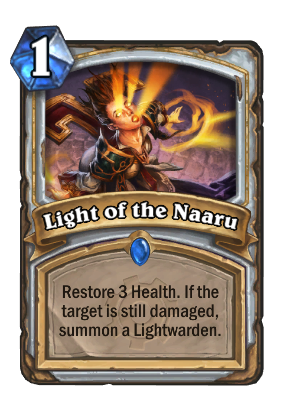 3 health for 1 mana is good, getting a Lightwarden which can potentially scale infinitely on top of that is great, having the flexibility to instead use it for 3 damage via auchenai is amazing. If you used Light of the Naaru with Auchenai Soulpriest and kill a 3 health minion, will the Lightwarden spawn? Injured Blademaster and this turn 4 would make a great aggro combo. Been looking down at the comments below.. I think we're missing something here. The card says Target.. and it never specified a Minion. Its probably likely that this could.. you know.. heal YOURSELF....?? Finally, someone that knows how to read. I really like this card. Sometimes you get a few 3 drops and you're in an awkward spot wishing you could get a circle or a turn 5 heal for your blademaster and you're stuck on turn 4. Turn 3 & 4 unhealed blademasters are usually killed straight away. Instead of them both being killed by most things you can put down a cultist for turn 3, and turn 4 a blademaster that's healed. And with the cleric synergy, along with using it to kill a minion with auchenai I definitely see it having a spot in my decks with all the uses and flexibility. it'll combo nicely if you're set with a cleric and injured blade, they'll have a tough time deciding what to kill. at one mana it's still value just for keeping your guys alive to trade and fits easily into the curve. I'd say no since the light warden is summoned after the heal. Combos really well with Injured Blademaster. 4/6 and a 1/3 on turn 4. Very solid. And it scales decent. Where does it say that you cant target face? In both cases as a heal on yourself and as a damage spell with auchenai it works quite well on heros. You can use it quite early on yourself in case your falling behind against an aggro deck and use your hero power to boot and make it a 5 heal 3/2 creature play.